You can sponsor Vonn from as little as €3 a week and change the life of a child with Autism. Make a difference today and order your puppy sponsorship starter pack. 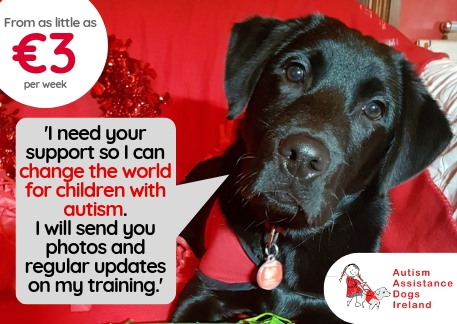 Vonn is a black Labrador who is destined to be an amazing Autism Assistance Dog. But to graduate and reach the high standard required to make a life changing impact, he needs your support. Regular updates from the puppy you sponsor on the fantastic progress they are making and the adventures they are having along the way. An Autism Assistance Dogs Ireland Calandar every year which is packed full of cute pictures of our amazing, life changing dogs. Signing up will take you through an eMandate process to support direct debit through our payments partner Nuapay.